I’ve been working through The New Rules of Lifting for Women (NRLW) for awhile now. I am proud to say that I have completed Stage 1 and hit some personal records! NRLW has 8 stages that you work through. Each Stage has different workouts. Stage 1 has two, cleverly named A and B. Each workout is a series of exercises with specified number of sets and reps. I had been working on Stage 1 last fall, but didn’t complete. I was almost at the end, but moving my weight bench and workout equipment for the holidays threw everything off. This spring I started again, right back at the beginning. I did take a couple of weeks off for work related travel, but otherwise I kept at it. Now I move on to Stage 2, which is much shorter. The whole plan is roughly supposed to take six months. Today, I did a personal best – I dead lifted 85 pounds for 3 sets of 8. In other words, I lifted the barbell 24 times! Yay! Compared to actual weightlifters, this is tiny potatoes (even smaller than plain old “small potatoes”), but for me it is huge! My goal is eventually to lift my own weight. I’m already well over half, I know I can do it! I’m a little nervous about the next stage – I had this one completely figured out and knew exactly how to do it. I don’t know how long Stage 2 will take in the morning or even how to do the exercises. I’ll figure them out though – that’s what the book is for, after all. I did notice that Stage 2 called for some cardio interval training, which is great. I’ve been wanting to get back to running too, and this might be just the motivation I need! This entry was posted in Health and Strength, Strength Training by GRLife. Bookmark the permalink. Way to PR! I’m with you in that I can’t post the kinds of big numbers that other weightlifters post (because I like running too much and good luck lifting heavy AND running) but it doesn’t make my PRs any less sweet. Also I love that you set up your bench in your library. The fitness nook in my house is also right by all of my bookshelves. Two of my favorite things in the same place! Yay for reading and fitness! 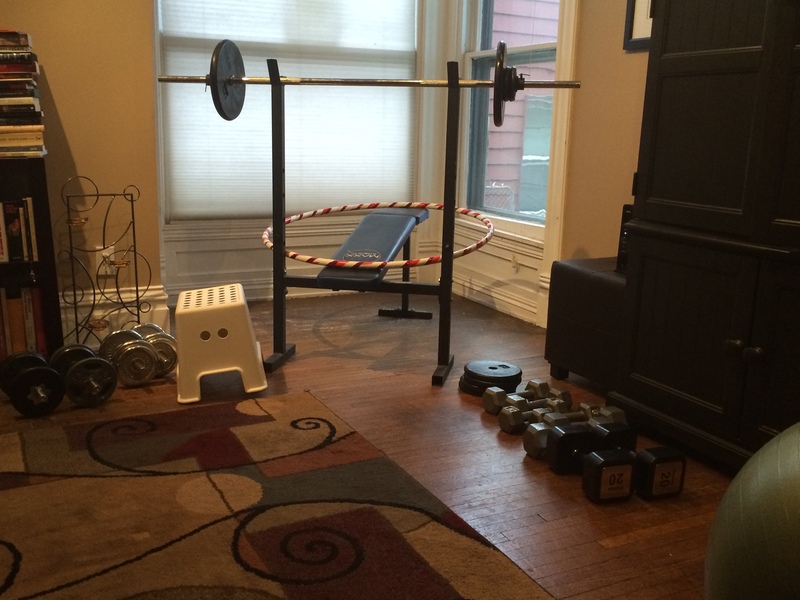 My boyfriend and I were recently discussing “dream houses” and I said that I need room in the middle of the house where I am sure to go for all my weights. Thanks so much for the comment Caitlin, it’s good to hear that others are in the same boat.